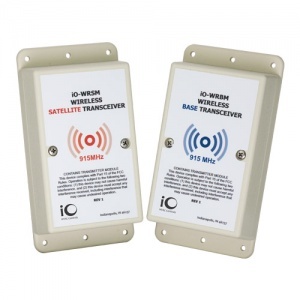 The iO-WR Wireless Relay Kit contains 2 four-channel transceivers. The base module has 3 transmitting channels and 1 receiving channel. The satellite module has 3 receiving channels and 1 transmitting channel. Each transceiver module uses a redundant transmission protocol for failsafe protection. If either module does not receive a valid “ON” or “OFF” transmission signal within 60 seconds, the output(s) will be turned off.